Opera's rising superstar, Angela Meade, has just been named Artist of the Year by the Washington National Opera (WNO). The May 13 announcement comes on the heels of the soprano’s triumphant company debut, in which she “thrilled WNO devotees with her nearly mind-blowing mastery of Bellini’s most challenging music” (Washington Times) in the title role of Norma. Previous recipients of the Artist of the Year award, which carries a $5,000 cash prize, include mezzo-sopranos Frederica von Stade and Denyce Graves, tenor Jerry Hadley, and conductor John Mauceri. This coming October, the soprano – who is also the winner of the 2012 Beverly Sills Artist Award and 2011 Richard Tucker Award – will reprise Bellini’s heroine at the Metropolitan Opera. 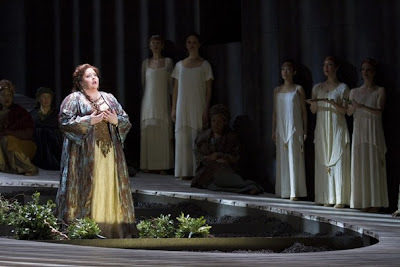 In the meantime, she looks forward to appearances as Donna Anna in Don Giovanni at Cincinnati Opera (June 13 & 15) and to her return to the Caramoor International Music Festival to celebrate the Verdi bicentennial. Besides performing the Italian composer’s Ave Maria, volgarizzata da Dante with string quartet (June 27), Meade will headline a semi-staged performance of Les vêpres siciliennes in the original French, with Will Crutchfield and the Orchestra of St. Luke’s (July 6).